Lying next to the island's beautiful Mediterranean coastline, in south-western Cyprus, the popular town of Paphos is typically Greek in character. Upper Paphos forms the traditional colonial centre and its old Turkish Quarter is especially low-key, while Lower Paphos is where the tourists head, for its endless array of restaurants, bars nightclubs. The historic town of Paphos, located in the south west of Cyprus, is full of ancient architectural and archaeological treasures. Paphos has been accredited as a UNESCO World Heritage site and is packed with palaces, forts, Tombs, mosaics and ancient villas. One of the Mediterranean's most popular destinations, direct flights to Paphos can be found on low cost airlines such as easyJet and Jet2. The town of Paphos is split into two areas called Kato Paphos (lower) and Ktima Paphos (upper). 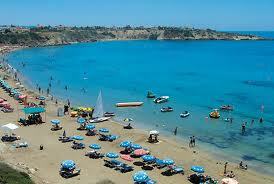 Kato Paphos is the coastal area complete with a pretty harbour and beautiful sandy beaches close by. This part of Paphos is very popular with package holiday tourists and gets extremely busy in the peak months with visitors attracted by the energetic nightlife and Mediterranean climate. Ktima Paphos is home to the older and more sedate side of Paphos with stunning colonial buildings, a great choice of museums and some of the best restaurants on the island. Must sees in Paphos include the Paphos Archaeological Site in Kato Paphos – the site includes ruins of a huge sprawling city founded in 4BC with opulent buildings and famous mosaics which can be found in the southern part of the site. The mosaics depict various Greek myths and this amazing collection is spread through numerous rooms each with a fascinating story to tell. Another of Paphos’s most popular visitor attractions is the Tombs of the Kings. Located just north of Kato Paphos, the attraction comprises of some superbly preserved underground tombs and chambers which date back to 3BC and were used during the Hellenistic as well as during Roman times. Close to Paphos at Kouklia are the ruins of the Temple of Aphrodite, the Greek Goddess of love and beauty. Not much remains of the temple except for some of the foundations however some of the artefacts from the temple can be found on display in various museums across Cyprus. Due to its popularity and great climate cheap flights to Paphos, Cyprus can usually be found if you book early and avoid travelling during the busiest tourist seasons. Use our flight search box to find the cheapest flights as well as lastminute flights if you're booking a spur of the moment trip. Paphos enjoys a Subtropical-Mediterranean climate, with the greatest amounts of precipitation mainly occurring from mid-November to March. It practically never rains in the summer. In July and August, humidity measurements can go up to 85%. Snowfall occurs rarely, approximately every 10 years, although this does not normally lead to any significant disruption. Heat waves in July and August are a relatively common occurrence, where hot air masses from the Sahara desert drift over to Cyprus causing temperatures to rise.